Is it certain that the mod won't work unless you start a new game? Edit. BG1EE. And by working I mean the case appearing in Thalantyr's inventory. The problem is that if you buy or sell anything to someone, the items that are still for sale are stored in your save games. If you load a save game and interact with a store, the game will use the store that was saved in your save game instead of the original store. Sadly, mods can only update the original store and not the stores as they are saved in your save games. Do note that you can still cheat the item in. I hadn't visited Thalantyr's residence yet so that must be the reason. I like the fact that it costs a lot of money too. Yes, it will work if you haven't browsed his store yet. @Wilbur I thought it should require some measure of investment, since it's magical and safely stores all of one's fragile wands. And you can edit the save game with EEKeeper, NearInfinity, etc. I worship at your altars. @Mortianna @Alkalurops While I'm slowly preparing to start to play BGEE using my native language (Polish) I thought I'll translate your Wand Case mod. So here it is in attachment translated setup.tra and readme files for both BGEE and BG2EE versions. Feel free to add it to next version of your mod. I have noticed that when you open the case, the top-most name doesn't display properly in Polish. Seems to be a bug with unicode store names. If it hasn't already been reported, someone probably should. Okay, this time let's try to attach *both* versions... Although then again the only difference is the readme. @Alkalurops damn I thought I changed coding to UTF-8 but apparently I did not:( Thanks for being vigilant and thanks for update. I plan to translate @Mortianna's Staff of Withering when I have a moment too. I like those mods and would like to use them in my long planned run in Polish (haven't play BG in my native language for ages). @Alkalurops I just tested BG2EE version and it seems that there is indeed a glitch in the topmost name, but there is everything OK in the .tra file, changing coding to UTF-8 did not mess anything. Tagging @Dee and @AndreaColombo to make cerain if this is a BG2EE bug and not the mod (translation) related thing. @Alkalurops did you see the same glitch and if it was on BGEE or BG2EE? I tested both games, and both glitched. I'm almost positive this is a game glitch, since WANDCASE.sto and WANDCASE.itm both reference the same string entry in dialog.tlk. @Mortianna also those two mod archives are exactly the same except readme. You should combine readme for BG1EE and BG2EE and release one archive. Hi @Mortianna. I've noticed that your tp2 code is bugged when it comes to BGT and Tutu. In BGT it only adds stuff to BG1 stores. And in Tutu it doesn't work at all. means that what follows will be executed only when previous argument will NOT return true. Below I've attached fixed version of your mod that works with all games (including unreleased EET and vanilla BG2 without ToB which previously wasn't supported) and has the translation released by @Cahir. Readme files have been updated. 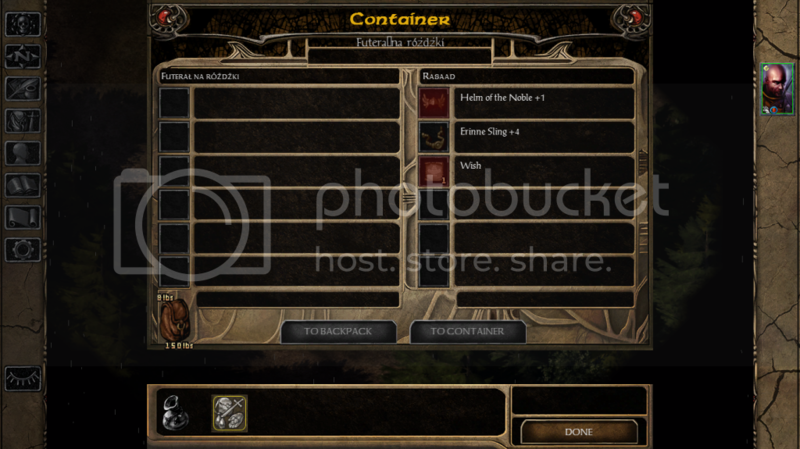 Additional second archive for BG:EE is not needed - this package covers all BG games. Let me know if you don't like these changes and I should remove the attachment. Thank you for taking the time and effort to make those changes to the mod. I hadn't considered that it might be appealing for players of the non-EE versions. Thank you! Added it to BGEE and SoD, it's a life-saver! I hadn't considered that it might be appealing for players of the non-EE versions. I translated this nice and useful mod in Italian. Attached my translation. Can you please add it to the mod? Found just one issue - if I want to take eg one wand of frost out of the case, it takes out all wands of frost I currently have. Anyone else get this? Glad someone made this. I have had similar thoughts for some years but never gotten the time to delv into modding and making it myself. Thank you! Great addition and nice work.